"Hawaiians" redirects here. For information on the population of Hawaii, see Demographics of Hawaii. For another uses, see Hawaiians (disambiguation). "Kanaka Maoli" redirects here. For other uses of Kanaka, see Kanaka (disambiguation). Native Hawaiians (Hawaiian: kānaka ʻōiwi, kānaka maoli and Hawaiʻi maoli) are the Aboriginal Polynesian people of the Hawaiian Islands or their descendants. Native Hawaiians trace their ancestry back to the original Polynesian settlers of Hawaiʻi. In total, 527,000 Americans consider themselves Native Hawaiian. According to the 2010 U.S. Census, there were 371,000 people who identified themselves as being "Native Hawaiian" in combination with one or more other races or Pacific Islander groups. 156,000 people identified themselves as being "Native Hawaiian" alone. The majority of Native Hawaiians reside in the state of Hawaii (two-thirds) and the rest are scattered among other states, especially in the American Southwest and with a high concentration in California. One theory is that the first Polynesians arrived in Hawaii in the 3rd century from the Marquesas by travelling in groups of waka, and were followed by Tahitians in AD 1300, who then conquered the original inhabitants. Another is that a single, extended period of settlement populated the islands. Evidence for a Tahitian conquest of the islands include the legends of Hawaiʻiloa and the navigator-priest Paʻao, who is said to have made a voyage between Hawaii and the island of "Kahiki" (Tahiti) and introduced many customs. Early historians, such as Fornander and Beckwith, subscribed to this Tahitian invasion theory, but later historians, such as Kirch, do not mention it. King Kalakaua claimed that Pa'ao was from Samoa. Some writers claim that other settlers in Hawaiʻi were forced into remote valleys by newer arrivals. They claim that stories about the Menehune, little people who built heiau and fishponds, prove the existence of ancient peoples who settled the islands before the Hawaiians ; but similar stories exist throughout Polynesia. At the time of Captain Cook's arrival in 1778, the population is estimated to have been between 250,000 and 800,000. Some Hawaiians left the islands during the period of the Kingdom of Hawaii like Harry Maitey, who became the first Hawaiian in Prussia. Over the span of the first century after first contact, the native Hawaiians were nearly wiped out by diseases introduced to the islands. Native Hawaiians had no resistance to influenza, smallpox, measles, or whooping cough, among others. The 1900 U.S. Census identified 37,656 residents of full or partial native Hawaiian ancestry. The 2000 U.S. Census identified 283,430 residents of Native Hawaiian or Pacific Islander ancestry, showing a dramatic growth trend since annexation by the U.S. in 1898. The Hawaiian language (or ʻŌlelo Hawaiʻi) was once the primary language of the native Hawaiian people; today, native Hawaiians predominantly speak the English language. A major factor for this change was an 1896 law that required that English "be the only medium and basis of instruction in all public and private schools". This law prevented the Hawaiian language from being taught as a second language. In spite of this, some native Hawaiians (as well as non-native Hawaiians) have learned ʻŌlelo as a second language. As with others local to Hawaii, native Hawaiians often speak Hawaiian Creole English (referred to in Hawai'i as Pidgin), a creole which developed during Hawaiʻi's plantation era in the late nineteenth and early twentieth centuries with the influence of the various ethnic groups living in Hawaii during that time. Nowadays ʻŌlelo Hawaiʻi is the official language of the State of Hawaii, alongside English. The Hawaiian language has been promoted for revival most recently by a state program of cultural preservation enacted in 1978. Programs included the opening of Hawaiian language immersion schools, and the establishment of a Hawaiian language department at the University of Hawaiʻi at Mānoa. As a result, Hawaiian language learning has climbed among all races in Hawaiʻi. In 2006, the University of Hawaii at Hilo established a masters program in the Hawaiian Language. In fall 2006, they established a doctoral (Ph.D) program in the Hawaiian Language. In addition to being the first doctoral program for the study of Hawaiian, it is the first doctoral program established for the study of any native language in the United States of America. Both the masters and doctoral programs are considered by global scholars as pioneering in the revival of native languages. Hawaiian is still spoken as the primary language by the residents on the private island of Niʻihau. Alongside ʻŌlelo Hawaiʻi, some Maoli (Native Hawaiians) spoke Hawaiʻi Sign Language (or HSL). Little is known about the language by Western academics and efforts are being made to preserve and revitalize the language. Hawaiian children are publicly educated under the same terms as any other children in the United States. In Hawaii, native Hawaiians are publicly educated by the Hawaiʻi State Department of Education, an ethnically diverse school system that is the United States' largest and most centralized. Hawaiʻi is the only U.S. state without local community control of public schools. Under the administration of Governor Benjamin J. Cayetano from 1994 to 2002, the state's educational system established special Hawaiian language immersion schools. In these schools, all subject courses are taught in the Hawaiian language and use native Hawaiian subject matter in curricula. These schools were created in the spirit of cultural preservation and are not exclusive to native Hawaiian children. Native Hawaiians are eligible for an education from the Kamehameha Schools, established through the last will and testament of Bernice Pauahi Bishop of the Kamehameha Dynasty. The largest and wealthiest private school in the United States, Kamehameha Schools was intended to benefit indigents and orphans, with preference given to native Hawaiians. The Kamehameha Schools provides a quality education to thousands of children of whole and part native Hawaiian ancestry at its campuses during the regular school year, and also has quality summer and off-campus programs that are not restricted by ancestry. Kamehameha Schools' practice of accepting primarily gifted students, in lieu of intellectually challenged children, has been a controversial topic amongst the native Hawaiian community. Many 'rejected' families feel that the gifted students could excel at any learning institution, public or private. Thus, the Hawaiian community may be better served by educating children from high-risk, high-crime districts so that a greater proportion of disadvantaged youths may grow up to be responsible community contributors. As with other children in Hawaiʻi, some native Hawaiians are educated by other prominent private academies in the Aloha State. They include: Punahou School, Saint Louis School, Mid-Pacific Institute, and Iolani School. Similar to the Indigenous communities of the Americas, Native Hawaiian children enthusiastically contribute alongside the adults, and the adult's presence is there to offer support. In most Native Hawaiian communities, household work tasks, such as ironing and cooking, etc., play a major role in contributing to the home life and children’s participation enhances their importance within the family. Native Hawaiian children have shared aspirations to accomplish collaborative tasks, and they individually take initiative to work together. Children absorb very early the community-wide belief that hana (work) is respected and laziness is shameful. The phrase “E hoʻohuli ka lima i lalo” (The palms of the hands should be turned down) was used to communicate the idea that idleness (associated with upturned palms) was to be avoided. Native Hawaiian children cooperate with flexible leadership to combine their skills, ideas, and abilities, like that found in Learning by Observing and Pitching In (LOPI) in the Indigenous Communities of the Americas. Family organization is a “shared-function” system that includes flexible roles and fluid responsibility within the group. Basic family values include interdependence, responsibility for others, sharing of work and resources, obedience, and respect. Children assume important family responsibilities early and act as members of a sibling workforce that is held collectively responsible for completing tasks. Children also take initiative to help others in the classroom. It has been observed that when children are working in a group with their peers and face difficulty, they will scan the room for an adult to assist or turn to their close fellows to either ask for help. Children also scan to provide help to others when necessary. In this way, children shift between the roles of assisted and assistant. Adults were present and available, but the children were more often found to take the initiative to learn from, and teach, one another how to perform tasks such as sweeping, homework, and caring for younger siblings. Among Native Hawaiians, the goal of learning is to transform participation to encompass conscientious accountability as active contributing members of the community, like that found in LOPI. For example, in some Native Hawaiian communities, parent(s) teach the older siblings the necessary skills of care taking. Sibling care-taking skills can relate to Indigenous American ways of learning by the children becoming considerate of their parents and taking on the responsibility when needed in case of a tragic incident with the parents. Within the classroom and home settings, adults are present but are not always directly monitoring the children. Children ask for help when necessary, but adults appear to rarely interject. Children appeared to adapt to tasks and situations by observations and go off on their own to collectively work out how and what to do to complete the task. Assuming and initiating care has been found across Polynesian cultures, and Native Hawaiian practices are in keeping with this trend. One study observed, interviewed, and evaluated families on the Polynesian Island Sikaiana and found that fostering children from other families within the community is a common shared endeavor that serves to construct relationships, support the community, and nurture compassion and sympathy (aloha). As children mature within the family, they go through a process of having their needs attended and learn to provide and care for the younger children alongside the adults. Adolescent girls who are active caretakers are referred to as parents, even if there is no biological connection. The Hawaiians’ ways of learning include wide keen attention from the children while adults are available for guidance, also found in the model of Learning by Observing and Pitching In. Children were found to learn from adults by participating in group activities where they had the chance to observe the performance of more experienced participants as well as having errors in their own performance corrected by more seasoned group members. Because the children learn through observation, and then are encouraged to practice among their peers, we can speculate the children have keen attention to events around them, which is an expectation of adults and community members who are there to assist when needed. It has been observed that Hawaiian children were successful at completing tasks which greatly depend on visual and memory process skills, which coincides with Hawaiian mother’s frequent use of non-verbal communication. In some Native Hawaiian communities, there is a constant use of “talk story” which plays an essential role in promoting solidarity in the community by not overpowering or making the members of the community feel inadequate for not understanding something. Talk story can consist of recalled events, folktales, and joking. Joking can be used to tease and guide the children about how to do a chore better or to avoid serious trouble. Talk story relates to an Indigenous way of learning by providing conversations such as narratives and dramatizations with verbal and nonverbal communication between the elder and children. Another example of verbal communication in the Native Hawaiian culture is through the use of chanting, which can allow a child to understand the relationship of their present experiences to those of their ancestors, both alive and deceased. Chanting also allows children to understand the connections of their chants to mother earth. For instance, chanting can voice the need for rain to produce plants and induce ponds to grow fish for harvest. A study comparing Midwestern and Hawaiian mother – Kindergartener pairs presented with a novel task, found Hawaiian mothers to be much lower than their Midwestern counterparts in the use of verbal-control techniques and much higher in non-verbal communication, a finding which implies coordination through non-verbal and verbal means. Aspects of togetherness, continuity, purpose, and significance are a part of learning and coincide with the Native Hawaiian’s spiritual connection to earth and environment. There is verbal and nonverbal guidance from parents to children with chores and other activities. For example, a pat on the shoulder can communicate to the child that he/she is doing the activity at hand the correct way. This example relates to the LOPI model by there being an appraisal from the parent(s) in order to support their progress in learning and contributing better in the community. As the child gradually advances towards more complex tasks, the goal of mastery and feedback on the adequacy of their contributions become more pronounced. In the context of producing objects e.g. baskets, mats, or quilts, there was a belief that a child must produce a perfect end-product before moving on to learn the skills of producing something else. Perfection in these products was judged by more experienced craftspeople and was attained by repeated attempts interspersed with feedback. The perfected final products were kept as a special reminder and never used. Their production was seen as a necessary first step in “clearing the way” for other products to come; an indication of mastery for that skill set. Throughout several research articles, it becomes clear that many of the Native Hawaiian ways of learning resemble the defining characteristics of LOPI, which is common in many Indigenous communities of the Americas. Native Hawaiian culture has seen a revival in recent years as an outgrowth of decisions made at the 1978 Hawaiʻi State Constitutional Convention, held 200 years after the arrival of Captain Cook. At the convention, the Hawaiʻi state government committed itself to a progressive study and preservation of native Hawaiian culture, history, and language. A comprehensive Hawaiian culture curriculum was introduced into the State of Hawaiʻi's public elementary schools teaching: ancient Hawaiian art, lifestyle, geography, hula, and Hawaiian language vocabulary. Intermediate and high schools were mandated to impose two sets of Hawaiian history curricula on every candidate for graduation. Statutes and charter amendments were passed acknowledging a policy of preference for Hawaiian place and street names. For example, with the closure of Barbers Point Naval Air Station in the 1990s, the region formerly occupied by the base was renamed Kalaeloa. Another important outgrowth of the 1978 Hawaiʻi State Constitutional Convention was the establishment of the Office of Hawaiian Affairs, more popularly known as OHA. Delegates that included future Hawaiʻi political stars Benjamin J. Cayetano, John D. Waihee III, and Jeremy Harris enacted measures intended to address injustices toward native Hawaiians since the overthrow of the Kingdom of Hawaiʻi in 1893. OHA was established as a trust, administered with a mandate to better the conditions of both native Hawaiians and the Hawaiian community in general. OHA was given control over certain public lands, and continues to expand its land-holdings to this day (most recently with Waimea Valley, previously Waimea Falls Park). Besides purchases since its inception, the lands initially given to OHA were originally crown lands of the Kingdom of Hawaiʻi used to pay the expenses of the monarchy (later held by the Provisional Government following the fall of the monarchy in 1893). Upon the declaration of the Republic of Hawaiʻi, they were officially designated as public lands. They were ceded to federal control with the establishment of the Territory of Hawaiʻi in 1898, and finally returned to the State of Hawaiʻi as public lands in 1959. OHA is a semi-autonomous government body administered by a nine-member board of trustees, elected by the people of the State of Hawaiʻi through popular suffrage. Originally, trustees and the people eligible to vote for trustees were restricted to native Hawaiians. Rice v. Cayetano—suing the state to allow non-Hawaiians to sit on the board of trustees, and for non-Hawaiians to be allowed to vote in trustee elections—reached the United States Supreme Court, which ruled in favor of Rice on February 23, 2000, forcing OHA to open its elections to all residents of the State of Hawaiʻi, regardless of ethnicity. In 1974, the Native American Programs Act was amended to include native Hawaiians. This paved the way for native Hawaiians to become eligible for some, but not all, federal assistance programs originally intended for Continental Native Americans. Today, Title 45 CFR Part 1336.62 defines a Native Hawaiian as "an individual any of whose ancestors were natives of the area which consists of the Hawaiian Islands prior to 1778". There is some controversy as to whether or not native Hawaiians should be considered in the same light as Native Americans. On November 23, 1993, U.S. President Bill Clinton signed United States Public Law 103-150, also known as the Apology Resolution, which had previously passed Congress. This resolution "apologizes to Native Hawaiians on behalf of the people of the United States for the overthrow of the Kingdom of Hawaii". In the early 2000s, the Congressional delegation of the State of Hawaiʻi introduced the Native Hawaiian Federal Recognition Bill, beginning the process of recognizing and forming a Native Hawaiian government entity to negotiate with state and federal governments. The significance of the bill is that it would establish, for the first time in the history of the islands, a new political and legal relationship between a Native Hawaiian entity and the federal government. This Native Hawaiian entity would be a newly created one without any historical precedent in the islands, or direct institutional continuity with previous political entities (unlike many Native American Indian groups, for example). This bill came under scrutiny by the Bush administration's Department of Justice, as well as the United States Senate Judiciary Committee. The political context surrounding the Akaka Bill is both controversial and complex. Proponents, who consider the legislation an acknowledgement and partial correction of past injustices, include Hawaiʻi's Congressional delegation, as well as the former Republican Governor, Linda Lingle. Opponents include the U.S. Commission on Civil Rights, (who question the constitutionality of creating race-based governments), libertarian activists, (who challenge the historical accuracy of any claims of injustice), and other Native Hawaiian sovereignty activists, (who feel the legislation would thwart their hopes for complete independence from the United States). A Ward Research poll commissioned in 2003 by the Office of Hawaiian Affairs reported that "Eighty-six percent of the 303 Hawaiian residents polled by Ward Research said 'yes.' Only 7 percent said 'no,' with 6 percent unsure ... Of the 301 non-Hawaiians polled, almost eight in 10 (78 percent) supported federal recognition, 16 percent opposed it, with 6 percent unsure." A Zogby International poll commissioned in 2009 by the Grassroot Institute of Hawaii indicated that a plurality (39%) of Hawaiʻi residents opposed the Native Hawaiian Reorganization Act of 2009, and that 76% indicated that they were unwilling to pay higher taxes to cover any loss in tax revenues that might be incurred by the act. In 2005, with the support of Senator Daniel Inouye, federal funding through the Native Hawaiian Education Act created the Center for Excellence in Native Hawaiian Law at the University of Hawaiʻi at Mānoa's William S. Richardson School of Law. A few years later, the program became known as Ka Huli Ao: Center for Excellence in Native Hawaiian Law. The inaugural director of Ka Huli Ao is Honolulu attorney Melody Kapilialoha MacKenzie. MacKenzie is also recognized as the chief editor of the Native Hawaiian Rights Handbook, which is a legal publication that describes Native Hawaiian law, a subset of laws of the State of Hawaiʻi. MacKenzie worked as a clerk to the school of lawʻs namesake, William S. Richardson, for four years, and also served as the Executive Director of the Native Hawaiian Legal Corporation for four years, then worked as a senior staff attorney for another six years. Ka Huli Ao focuses on research, scholarship, and community outreach. Ka Huli Ao provides a monthly lunch-time discussion forum referred to as Maoli Thursday, which is free and open to the public. Ka Huli Ao maintains its own blog, as well as a Twitter account and a Facebook group. Ka Huli Ao also provides law students with summer fellowships. Law school graduates are eligible to apply for post-J.D. fellowships that last for one year. In 1873 the first native Hawaiians were given permission from King Lunalilo (prior emigration of native Hawaiians was not allowed) to permanently emigrate to the United States (Salt Lake City, Utah) whose names were Kiha Kaawa, and Kahana Pukahi. Kiha was adopted by Mormon Missionary President George Nebeker immediately upon arrival making Kiha Kaawa (Nebeker) the first native Hawaiian to become a US citizen in 1873. 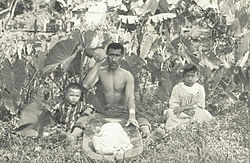 Hawaiian man with his two children, circa 1890. Several cultural preservation societies and organizations have been established over the course of the twentieth century. The largest of those institutions is the Bernice Pauahi Bishop Museum, established in 1889 and designated as the Hawaiʻi State Museum of Natural and Cultural History. Bishop Museum houses the largest collection of native Hawaiian artifacts, documents, and other information available for educational use. Most objects are held for preservation alone. The museum has links with major colleges and universities throughout the world to facilitate research. With the support of the Bishop Museum, the Polynesian Voyaging Society's double-hulled canoe, Hōkūle‘a, has contributed to rediscovery of native Hawaiian culture, especially in the revival of non-instrument navigation, by which ancient Polynesians originally settled Hawaiʻi. One of the most commonly known arts of Hawaii is hula dancing. It is an interpretive dance, famous for its grace and romantic feel, that expresses stories and feelings from almost any phase of life. ^ a b Hixson, Linsday; Hepler, Bradford; Ouk Kim, Myoung (May 2012). 2010 Census Brief, The Native Hawaiian and Other Pacific Islander Population: 2010 (PDF) (Report). United States Census Bureau. p. 15. C2010BR-12. Retrieved 10 March 2019. "There were 156,000 people who reported Native Hawaiian with no additional detailed NHPI group or race group and an additional 371,000 people who reported Native Hawaiian in combination with one or more other races and/or detailed NHPI groups ... Thus, a total of 527,000 people reported Native Hawaiian alone or in any combination." ^ "American Heritage Dictionary Entry: native hawaiian". The American Heritage Dictionary of the English Language (Fifth ed.). Retrieved March 23, 2015. ^ Kirch, Patrick Vinton; Green, Roger C (2001). Hawaiki, ancestral Polynesia : an essay in historical anthropology. Cambridge New York: Cambridge University Press. ISBN 9780521783095. OCLC 57218655. ^ The best survey of these stories, all collected in the latter part of the 19th century, is found in Beckwith's Hawaiian mythology, pp. 321-336. ^ Schmitt, Robert C. (June 1971). "New Estimates of the Pre-censal Population of Hawaii". Journal of the Polynesian Society. Auckland, New Zealand: Polynesian Society. 80 (2): 237–243. ISSN 0032-4000. OCLC 557485930. Retrieved May 19, 2012. Contemporary estimates for the date of first contact ranged from 200,000 to 400,000, and retrospective guesses by later historians dipped as low as 100,000. Most modern authorities, however, seem to agree on a 1778 total close to 300,000, although on evidence of the flimsiest kind. ^ Stannard, David E (1989). Before the horror : the population of Hawaiʻi on the eve of Western contact. Honolulu, HI, USA: Social Science Research Institute, University of Hawaii. pp. 78–80. ISBN 0824812328. OCLC 596521023. LCC GN 875 .H3 S731 1989. Retrieved May 19, 2012. The obvious conclusion, then, is that a population for Hawaiʻi of about 800,000 at the time of Western contact seems a restrained and modest figure. ^ US Census Bureau - Population Division (September 13, 2002). "Table 26. Hawaii - Race and Hispanic Origin: 1900 to 1990" (PDF). census.gov. Washington, DC, USA: U.S. Census Bureau. Second table. Archived from the original (PDF) on February 1, 2012. Retrieved June 2, 2012. ^ Lyovin, Anatole V (1997). An Introduction to the Languages of the World. New York: Oxford University Press, Inc. p. 258. ISBN 0-19-508116-1. ^ a b c Pukui, M. K., Haertig, E. W., Lee, C. A., & Queen Liliʻuokalani Children's Center. (1972). Nānā i ke kumu: Look to the source. Honolulu, HI: Hui Hanai. ^ a b Boggs, Joan. 1968. Hawaiian Adolescents And Their Families. Studies In A Hawaiian Community : Na Makamaka O Nanakuli. Honolulu: Bernice P. Bishop Museum, Dept. of Anthropology. http://ehrafworldcultures.yale.edu/document?id=ov05-021. ; P. 66 & 72. ^ a b Donner, W. W. (1999). Sharing and Compassion: Fosterage in a Polynesian Society. Journal of Comparative Family Studies, 30(4), autumn, 703-722. Retrieved May 25, 2017. ^ Speidel, G. E., Farran, D. C., & Jordan, C. (1989). 6: On the Learning and Thinking Styles of Hawaiian Children. In Thinking Across Cultures (pp. 55-77). Hillsdale, NJ: Lawrence Erlbaum Associates. ^ Boyd, Manu (July 3, 2006). "OHA gains Waimea Valley title". Honolulu, HI, USA: Office of Hawaiian Affairs. Archived from the original on September 27, 2006. Retrieved May 19, 2012. ^ "Are kanaka maoli indigenous to Hawai'i?". kenconklin.org. Archived from the original on May 1, 2015. Retrieved June 16, 2015. ^ Apoliona, Haunani (April 3, 2005). "Another Perspective: Scientific poll shows majority favors Hawaiian programs". Honolulu Star-Bulletin. Honolulu, HI, USA: Black Press Group Ltd. ISSN 0439-5271. OCLC 9188300, 433678262, 232117605, 2268098. Retrieved June 2, 2012. ^ Korn, Cheryl (November 24, 2009). "Results from Zogby International interactive poll commissioned by the Grassroot Institute of Hawaii" (PDF). grassrootinstitute.org. Zogby International. Honolulu, Hawaii: Grassroot Institute of Hawaii. Archived from the original (PDF) on December 23, 2010. Retrieved June 2, 2012. ^ Unattributed (July 25, 2007). "Hawaiian Cultural Heritage". Papahānaumokuākea Marine National Monument (in English and Hawaiian). United States National Oceanic and Atmospheric Administration. Archived from the original on September 16, 2008. Retrieved September 6, 2008. Discusses Hōkūle‘a's Navigating Change voyage which also raised consciousness of the interdependence of Hawaiians, their environment, and their culture. Hanifin, Patrick (2002). "To Dwell on the Earth in Unity: Rice, Arakaki, and the Growth of Citizenship and Voting Rights in Hawaii" (PDF). Hawaii Bar Journal. Honolulu, HI, USA: Hawaii State Bar Association. 5 (13): 15–44. ISSN 0440-5048. OCLC 1775767, 474805275. Archived (PDF) from the original on April 3, 2002. Retrieved May 19, 2012. Hanifin, Patrick W. (1982). "Hawaiian Reparations: Nothing Lost, Nothing Owed" (PDF). Hawaii Bar Journal. Honolulu, HI, USA: Hawaii State Bar Association. XVII (2). ISSN 0440-5048. OCLC 1775767, 474805275. Archived (PDF) from the original on March 4, 2000. Retrieved June 2, 2012. Kauanoe, Derek; Breann Swann Nuuhiwa (May 11, 2012). "We are Who We Thought We Were: Congress' Authority to Recognize a Native Hawaiian Polity United by Common Descent". Asian-Pacific Law & Policy Journal. 13 (2): 117. SSRN 2126441. Garcia, Ryan William Nohea (April 14, 2010). "Who Is Hawaiian, What Begets Federal Recognition, and How Much Blood Matters" (PDF). Asian-Pacific Law & Policy Journal. Honolulu, HI, USA: William S. Richardson School of Law at the University of Hawaii. 11 (2): 85. SSRN 1758956. Wikimedia Commons has media related to Native Hawaiians. U.S. Census Bureau. "Newsroom: Facts on the the [sic] Native Hawaiian and Other Pacific Islander Population". Washington, DC, USA: U.S. Census Bureau. Archived from the original on May 16, 2012. Retrieved June 2, 2012.